Households in Afghanistan are under extreme pressure to cope with shocks of more than 40 years of endless hostility leading to extreme problem of human misery, lasting violence and bloodshed, displacement of population, outflow of refugees, destruction of infrastructure, and disruption of social and economic environment. Under such circumstances, the vulnerable segment of population struggle to cope up with numerous shocks in their day to day life. 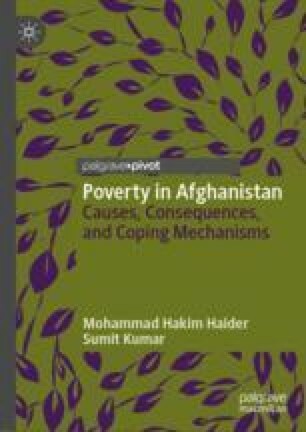 Understanding of the nature, dimensions, pattern and severity of shocks and the consequent coping strategies adopted by the vulnerable segments of the Afghan society are analysed in this chapter. The poor households suffered more from idiosyncratic shocks. In case of generic shocks, the picture is mixed for the poor and non-poor households. Households initially chose non-erosive strategies and when their options are exhausted the poor households tend to choose erosive coping mechanisms. Canagarajah, Sudharshan, Paul B. Siegel, Karin Heitzmann, and P. Sudharshan Canagarajah. 2002. “Guidelines for Assessing the Sources of Risk and Vulnerability.” 0218. Social Protection Discussion Paper Series. Washington, DC. http://documents.worldbank.org/curated/en/370781468762886906/Guidelines-for-assessing-the-sources-of-risk-and-vulnerability. Crawford, Neta C. 2015. “War-Related Death, Injury, and Displacement in Afghanistan and Pakistan 2001–2014.” Providence. https://watson.brown.edu/costsofwar/files/cow/imce/papers/2015/War%20Related%20Casualties%20Afghanistan%20and%20Pakistan%202001-2014%20FIN.pdf. Del Ninno, Carlo, and Alessandra Marini. 2005. “Household’s Vulnerability to Shocks in Zambia.” SP 0536. Social Protection Discussion Paper Series. Washington, DC. http://documents.worldbank.org/curated/en/181701468168861866/Households-vulnerability-to-shocks-in-Zambia. Jha, Raghbendra, Hari K. Nagarajan, and Kailash C. Pradhan. 2012. “Household Coping Strategies and Welfare: Does Governance Matter?” 2012/14. NCAER Working Papers on Decentralisation and Rural Governance in India. New Delhi. http://www.ncaer.org/free-download.php?pID=216. Kanbur, Ravi, Christina Malmberg Calvo, Monica Das Gupta, Christiaan Grootaert, Victoria Kwakwa, and Nora Lustig. 2000. “World Development Report 2000/2001: Attacking Poverty.” Washington, DC. http://documents.worldbank.org/curated/en/230351468332946759/World-development-report-2000-2001-attacking-poverty. Kozel, Valerie, Pierre Fallavier, and Reena Badiani. 2008. “Risk and Vulnerability Analysis in World Bank Analytic Work: FY2000-FY2007.” SP 0812. Social Protection Discussion Paper. Washington, DC. http://documents.worldbank.org/curated/en/132701468315542069/Risk-and-vulnerability-analysis-in-World-Bank-analytic-work-FY2000-FY2007. Pain, Adam. 2007. “Afghanistan: The Context.” In Reconstructing Agriculture in Afghanistan, edited by Jacky Sutton and Adam Pain. Rugby, Warwickshire, UK: Practical Action Publishing. https://doi.org/10.3362/9781780445731. Romero, Jose Manuel, and Geetha Nagarajan. 2011. “Impact of Micro-savings on Shock Coping Strategies in Rural Malawi.” SSRN Electronic Journal. https://doi.org/10.2139/ssrn.2443142. Snel, Erik, and Richard Staring. 2001. “Poverty, Migration, and Coping Strategies: An Introduction.” Focaal European Journal of Anthropology 38: 7–22. http://hdl.handle.net/1765/1860. United Nations Office for the Coordination of Humanitarian Affairs. 2015. “2016 Humanitarian Needs Overview: Afghanistan.” Kabul. https://www.humanitarianresponse.info/sites/www.humanitarianresponse.info/files/documents/files/afg_2016_hno_final_20151209.pdf. United States Agency for International Development. 1999. “Current Vulnerability Assessment Guidance Manual.” https://reliefweb.int/sites/reliefweb.int/files/resources/24A4D552049990E6C1256DA900403B18-fews-vulnerable-aug99.pdf. Velásquez-Castellanos, Iván, and Dil Bahadur Rahut. 2015. “Coping Strategies Adopted by Rural Extreme Poor Households in Bolivia.” Research Gate. https://www.researchgate.net/publication/266248446. Watts, M. J. 2013. Silent Violence: Food, Famine, and Peasantry in Northern Nigeria. Geographies of Justice and Social Transformation. University of Georgia Press. https://books.google.co.in/books?id=vRuvAAAAQBAJ. World Bank. 2013. “Afghanistan Economic Update.” Washington, DC. https://openknowledge.worldbank.org/bitstream/handle/10986/16510/770830REVISED0box377289B00PUBLIC00.pdf;sequence=1. World Health Organisation. 1998. “WHO/EHA Emergency Health Training Programme for Africa: Coping Mechanisms.” Addis Ababa. http://apps.who.int/disasters/repo/5517.pdf.